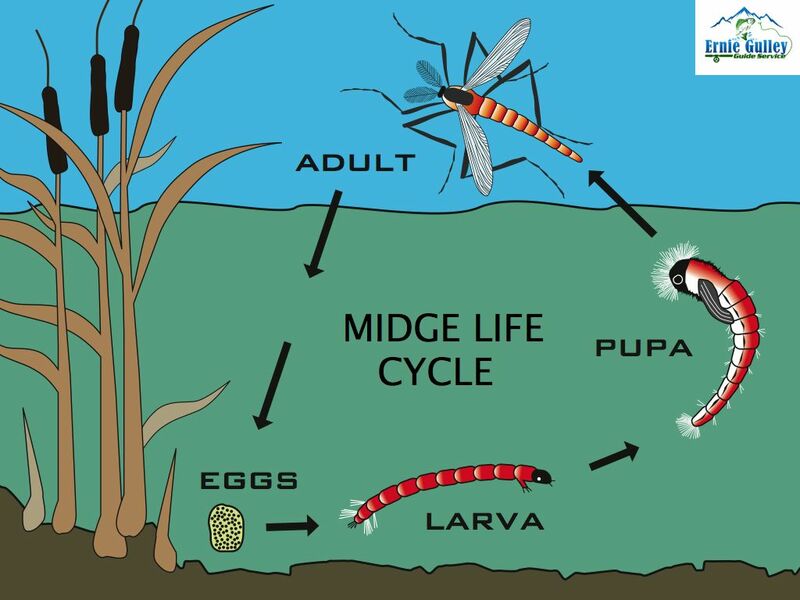 AS PROMISED EACH WEEK I WOULD TRY TO UPDATE MY BLOG AND THIS MONTH I WILL BE FOCUSING ON THE DIFFERENT STAGES OF THE CHIRONOMIDS LIFE CYCLE AND MY PHILOSOPHY ON HOW I ATTACK EACH STAGE OF THE CHIRONOMID LIFE CYLCE. OF COURSE EVERYONE FEELS AND FISHES DIFFERENTLY AND THATS FINE, I APPRECIATE AND RESPECT EVERYONES DIFFERENT THOUGHTS AND STYLES OF FISHING. THIS IS AN AMAZING BUG THAT IS MORE THAN 50% OF A TROUTS YEARLY FOOD SOURCE IN A STILLWATER ENVIRONMENT. HOPE YOU ENJOY AND FEEL FREE TO COMMENT ON EACH AND EVERY ONE OF MY BLOG POSTS. 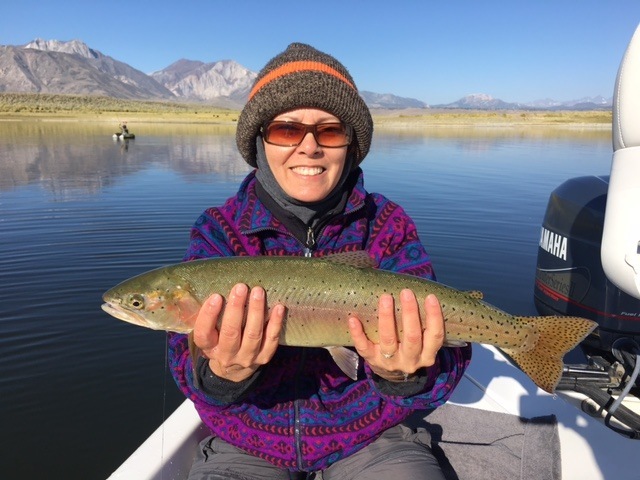 THE INTERNATIONAL FEDERATION OF FLY FISHERS 2016 FLY FISHING FAIRE IN BISHOP ON OCTOBER 14-16 IS JUST AROUND THE CORNER. RICK AND I WILL PRESENTING AND TEACHING CLASSES ON MANY DIFFERENT ASPECTS OF FLY FISHING INCLUDING STILLWATER, STREAMS AND RIVERS. MY CLINIC WILL BE ON SUNDAY FROM 8AM TO 12PM I WILL BE PRESENTING "CHIRONOMIDS FROM TOP TO BOTTOM" WHICH WILL BE THE MOST COMPREHENSIVE BREAK DOWN OF CHIRONOMID FISHING. I WILL HAVE A 40 MINUTE KEYNOTE PRESENTATION, 1 HOUR OF FLY TYING, 1 HOUR OF LEADERS, FLYLINES, RODS/REELS AND LEADER SETUPS. THEN A QUESTION AND ANSWER SESSION AFTERWARDS. I WILL ALSO SUPPLY YOU WITH A BEAUTIFUL FULL COLORED BOOKLET THAT YOU CAN TAKE HOME AND USE AS A REFERENCE FOR ANYTHING YOU WILL FORGET IN THE CLASS. 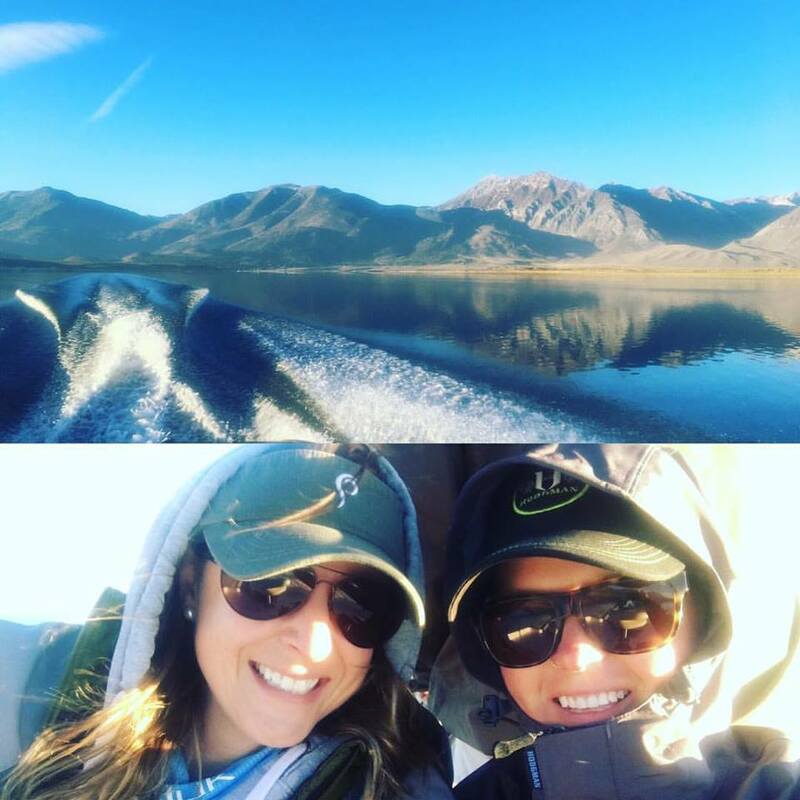 IT MAY JUST BE THE FIRST FEW DAYS OF AUTUMN BUT ITS GETTING CHILLY AT CROWLEY LAKE! THE RIDES OUT ON MY 22' FOOT SKEETER BAY BOAT AT OVER 35 MPH IN THE MORNINGS IS DOWN RIGHT COLD! BRING YOUR EXTRA LAYER OF CLOTHING AND THEN BE PREPARED TO TAKE THEM OFF AFTER 9AM. SUMMER IS DEFINITELY GONE AND FALL IS IN THE AIR. MORNING TEMPERATURES ARE DOWN INTO THE LOW 40's AND THE RIDE OUT TO THE FISHING GROUNDS IS VERY BRISK TO SAY THE LEAST. THE WATER TEMPERATURES HAVE DROPPED DRAMATICALLY ALSO, LAST MONDAY ON MY EARLY MORNING GUIDE TRIP I WAS IN THE NORTH ARM, BACK IN GREEN BANKS AREA AND THE SURFACE TEMPATURE WAS 61 DEGREES. THIS IS A LARGE DROP FROM JUST A FEW WEEKS AGO WHEN STARTING TEMPERATURES WERE IN THE HIGH 60'S. 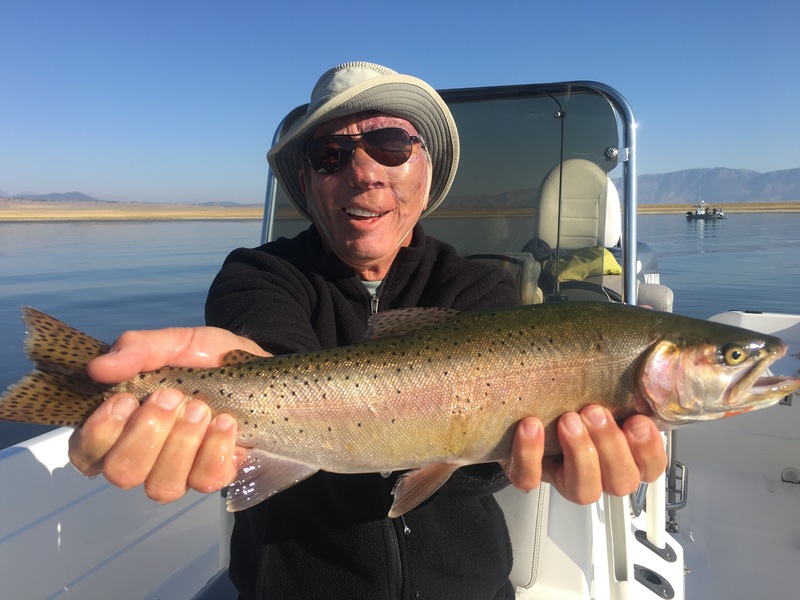 THIS IS GREAT FOR OUR TROUT AND ALSO WILL MAKE THE TROUT MORE ABLE TO SPREAD OUT IN THE NORTH ARM AND NOT BE LOCKED UP IN SUCH TIGHT SPACES LIKE THE MOUTH OF THE OWENS RIVER AND MOUTH OF MC GEE CREEK. FINDING FISH FROM DAY TO DAY IN THE NORTH ARM IS TOUGH. YOU HAVE TO MAKE MANY ADJUSTMENTS DAY TO DAY, HOUR TO HOUR. THE FISH ARE CONSTANTLY MOVING AROUND FROM 8 FEET OF WATER AT THE MOUTH OF THE OWENS, ALL THE WAY OUT TO 16+ FEET OF WATER BY NORTH LANDING POINT AND SIX BAYS. 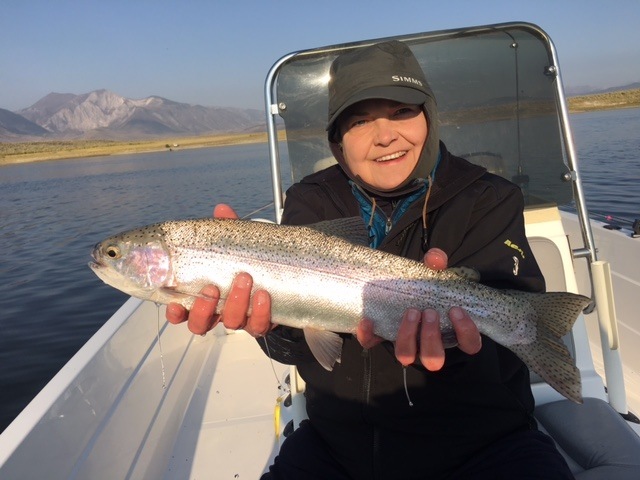 WHAT IS EXCITING LIKE LAST WEEK FOR ME AND THIS WEEK FOR OTHER GUIDES, YOU CAN BREAK OFF FROM THE FLEET AND BE ON SOME GREAT FISHING A FEW HUNDRED YARDS AWAY FROM EVERYONE ELSE. I HAVE BEEN FISHING THE SAME STANDARD BUGS FOR THE LAST MONTH, COPPER AND BLACK, COPPER/RED, GREY/BLACK AND GREY/RED. 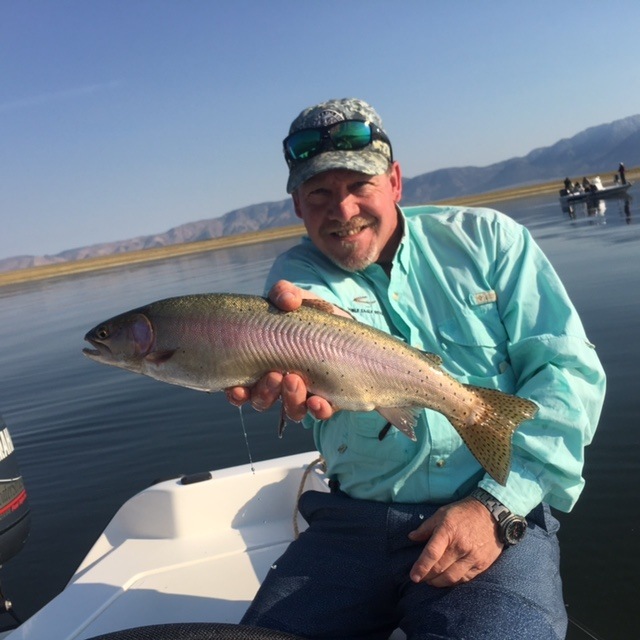 FISH DARKER COLORS LIKE A BLOOD MIDGE JUST A FEW INCHES OFF THE BOTTOM TO START, THEN IF YOUR TAKES SLOW DOWN AND YOU SEE BUGS HATCHING, MOVE ON TO THE GREY SERIES OF MIDGES AND MOVE THEM UP TO 12" TO 18" OFF THE BOTTOM. I AM STILL RUNNING MY BALANCED PERCH PATTERNS AS THE TOP FLY, 4 TO 5 FEET OFF THE BOTTOM AND THEN MY MIDGES FOR MY BOTTOM FLIES. SOME DAYS YOU MAY STRIKE OUT ON THE TOP FLY, HOWEVER SOME DAYS YOU CAN ALMOST GET INTO DOUBLE DIGIT NUMBERS ON THE PERCH PATTERNS. DON'T FORGET TO GIVE THOSE MIDGES A LOT OF TWITCHES TO GET THOSE TROUT TO TAKE YOUR FLIES. ANY MOVEMENT YOU CAN EVERY 30 TO 40 SECONDS WILL BE A BONUS AND GET YOU MORE TAKES DOWNS. A FUN WAY TO FISH IF YOU ARE NOT PRESSURED TO PUT A LOT OF FISH IN THE BOAT WHEN GUIDING IS TO TAKE OFF THE INDICATOR AND FISH THE MIDGES AND PERCH PATTERNS WITH YOUR HANDS. 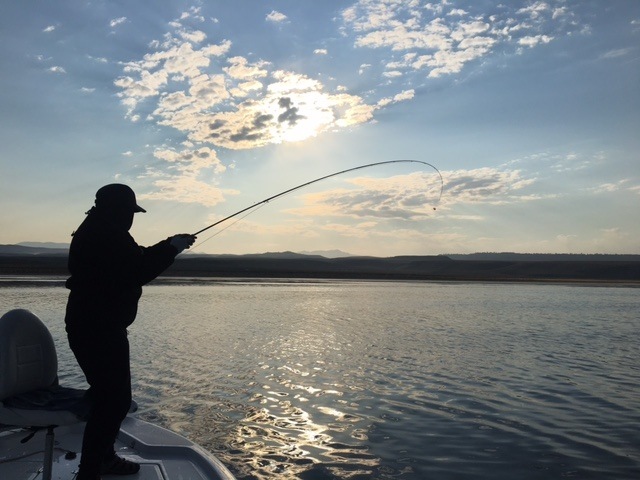 CAST UPWIND, AS FAR AS YOU CAN AND RETRIEVE YOUR FLIES AS CONSISTENTLY AS POSSIBLE BACK TO THE BOAT ALLOWING YOUR PATTERNS TO LOOK MORE NATURAL MOVING IN THE WATER COLUMN AND YOU WILL GET TAKES THAT WILL EXPLODE IN YOUR HANDS AND BREAK OFF 3X IMMEDIATELY. THIS IS A FUN WAY TO LEARN HOW TO FISH WITH YOUR HANDS AND CREATE THE MOVEMENT OF THE FLIES TO TRIGGER SOME FANTASTICALLY LARGER FISH THAN WHEN FISHING WITH THE INDICATOR ALL OF THE TIME. IF YOU WANT TO LEARN THIS TECHNIQUE, GIVE ME A CALL AND WE CAN SET UP A GUIDED TRIP AND I CAN TEACH YOU EVERYTHING YOU NEED TO BE SUCCESSFUL AT THIS TECHNIQUE. 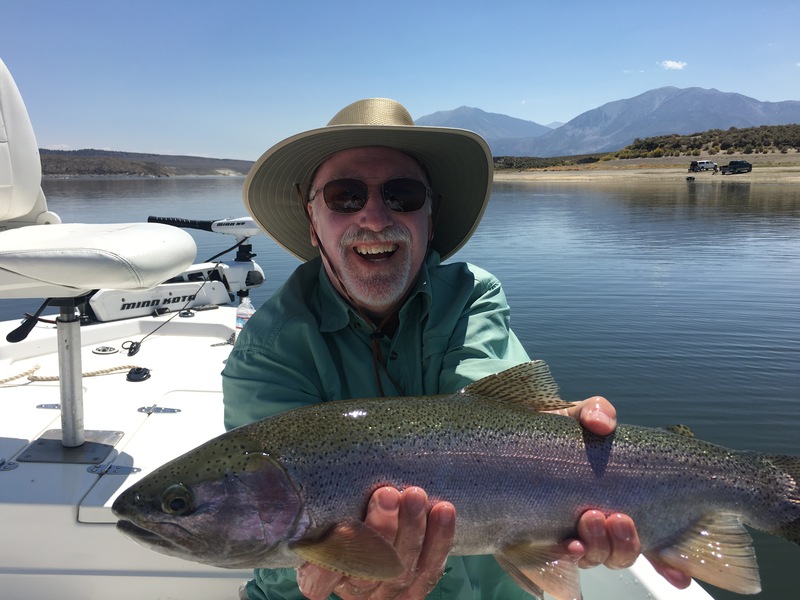 I WILL BE SPEAKING TO THE SOUTHERN SIERRA FLY FISHERS CLUB WHICH IS HEADQUARTERED IN KERNVILLE, CALIFORNIA, GATEWAY TO THE SOUTHERN SIERRA AND GOLDEN TROUT WILDERNESS AND THE BEAUTIFUL KERN RIVER. 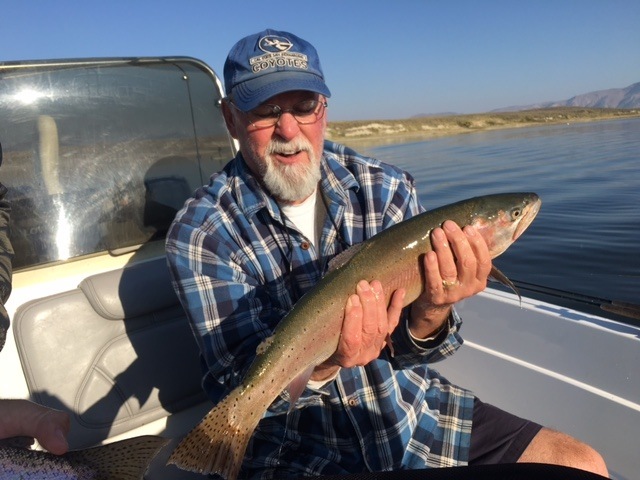 GUY GEANS, OWNER OF THE KERN RIVER FLY SHOP HAS A BEAUTIFUL FLY SHOP AND IS THE MASTER OF GUIDING THE KERN RIVER AND ITS SURROUNDING WATERS. 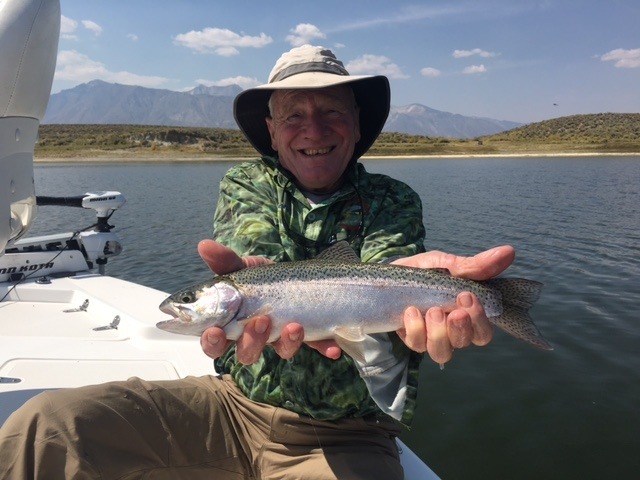 IF YOU COME UP TO SEE MY PRESENTATION "CROWLEY LAKE FLY FISHING TACTICS" WHICH IS THE MOST COMPREHENSIVE PROGRAM YOU WILL EVER SEE ON CROWLEY LAKE FLY FISHING, BE SURE TO STOP IN HIS SHOP AND LOOK AROUND, MAYBE EVEN HIRE HIM FOR A GUIDED TRIP. 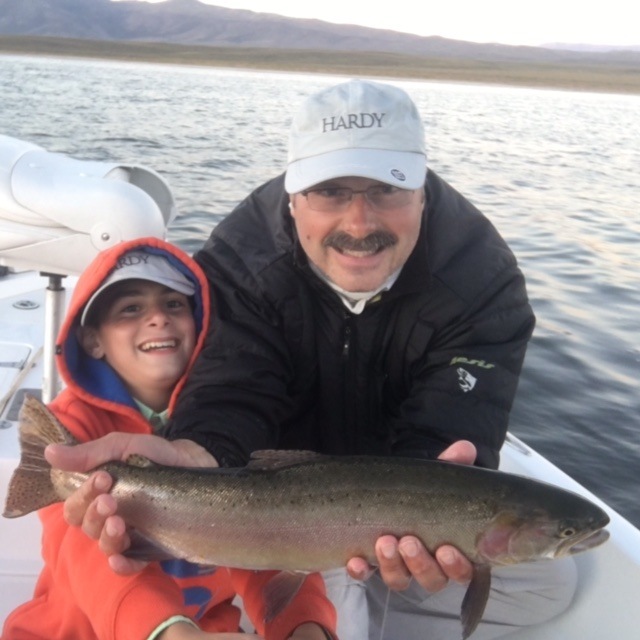 HE IS ONE OF THE BEST GUIDES AND BEST SERVICES YOU WILL FIND IN CALIFORNIA. 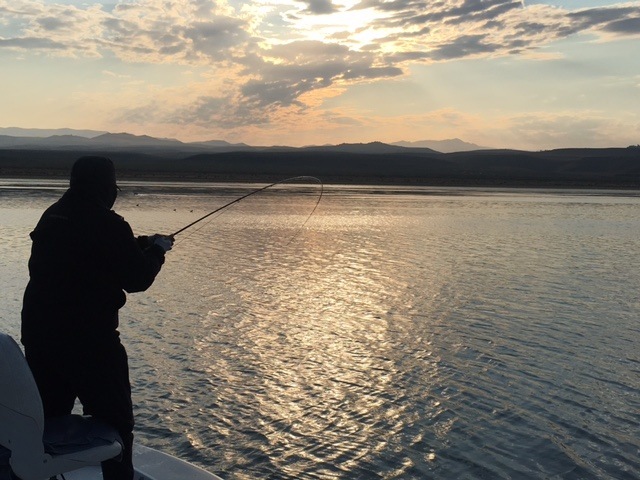 MY SHOW WILL BREAK DOWN EVERY ASPECT YOU WILL NEED TO KNOW ABOUT BEING SUCCESSFUL AND NOT STRUGGLING WITH FISHING CHIRONOMIDS AND PERCH PATTERNS AT CROWLEY LAKE. I WILL BREAK DOWN HOW THE FISH MOVE AROUND THE LAKE, WHEN EACH FOOD ITEM WILL APPEAR IN THE LAKE AND HOW TO ATTACK THESE FISH WHEN THEY ARE KEYING IN ON EACH INDIVIDUAL FOOD ITEM. I WILL BREAK DOWN WHAT RODS, REELS, LEADER SYSTEMS, PATTERNS AND HOW TO PROPERLY ANCHOR UP AND FISH EACH FOOD ITEM. 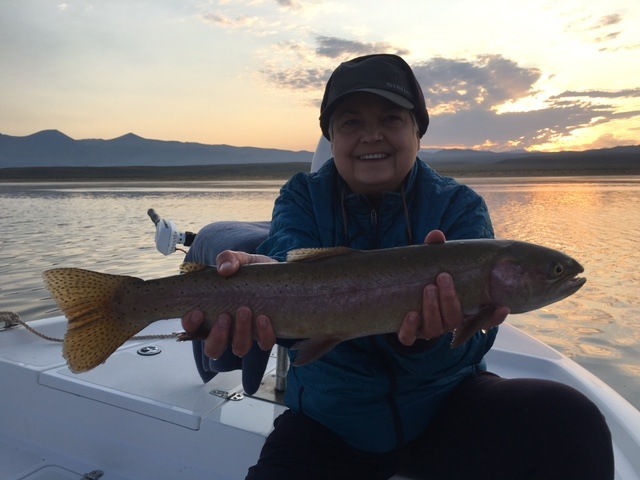 I HAVE SPENT TENS OF THOUSANDS OF HOURS ON THIS BODY OF WATER AND HAVE LEARNED SOME VERY SMALL NUANCES THAT I WILL SHARE WITH YOU SO YOU CAN BE BETTER THAN THE OTHER FLY ANGLERS OUT ON THE LAKE. 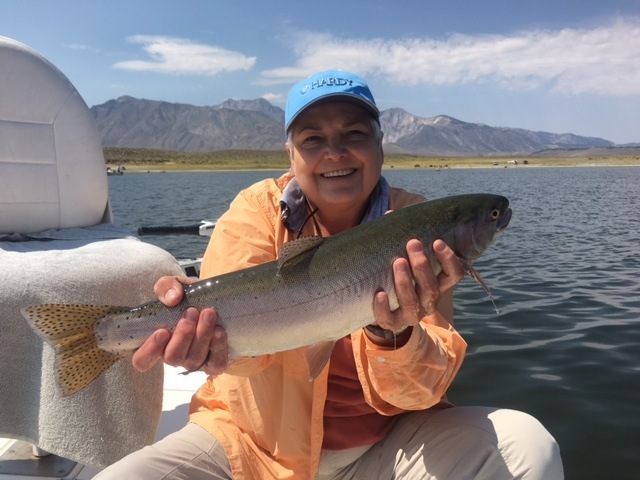 SPEAKING OF PRESENTATIONS, I AM VERY HAPPY TO ANNOUNCE I WILL BE SPEAKING ON OCTOBER 16TH FROM 8AM TO NOON AT THE FLY FISHING FAIRE AT THE TRI-COUNTY FAIRGROUNDS IN BISHOP, CALIFORNIA. 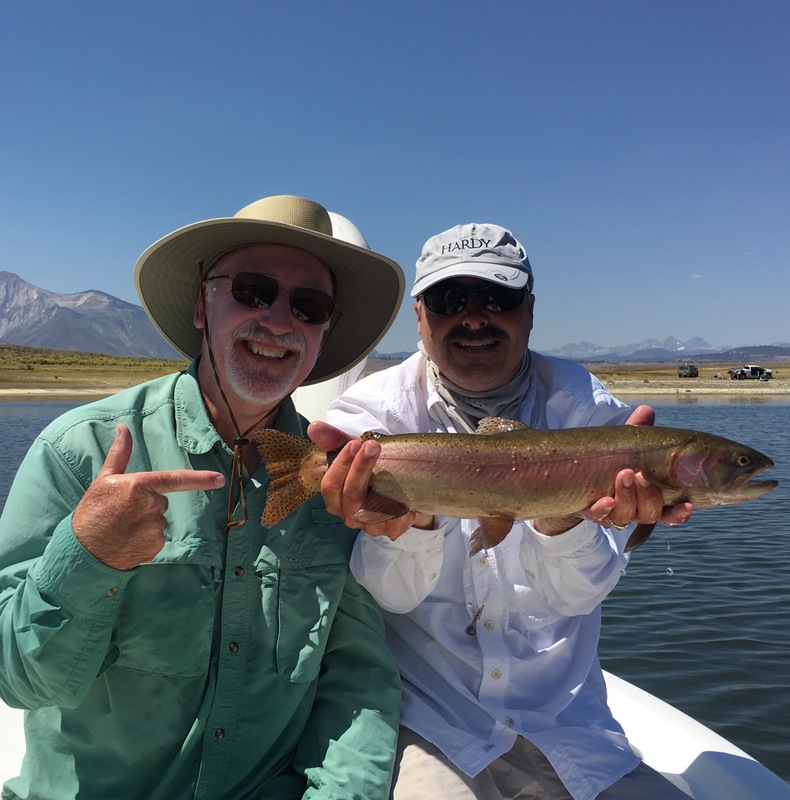 MY WORKSHOP WILL BE "CHIRONOMIDS FROM TOP TO BOTTOM" AND I WILL BREAK DOWN EVERY APSECT ABOUT THE BUGS LIFE CYCLE AND HOW YOU NEED TO FISH EACH CYCLE TO BE A BETTER CHIRONOMID FLY FISHING ANGLER. 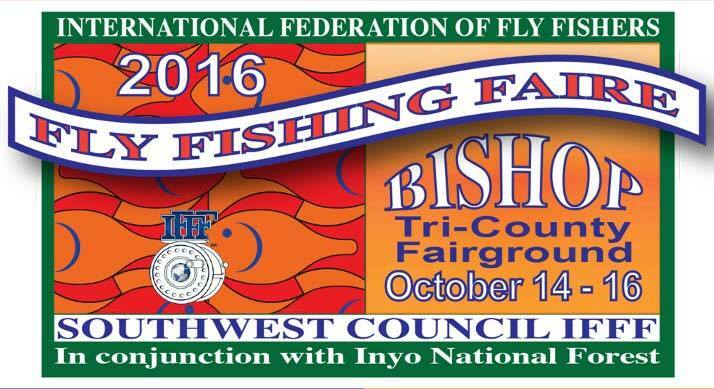 THIS IS A GREAT FLY FISHING FAIRE PUT TOGETHER BY THE FEDERATION OF FLY FISHERS, SOUTHWEST COUNCIL. 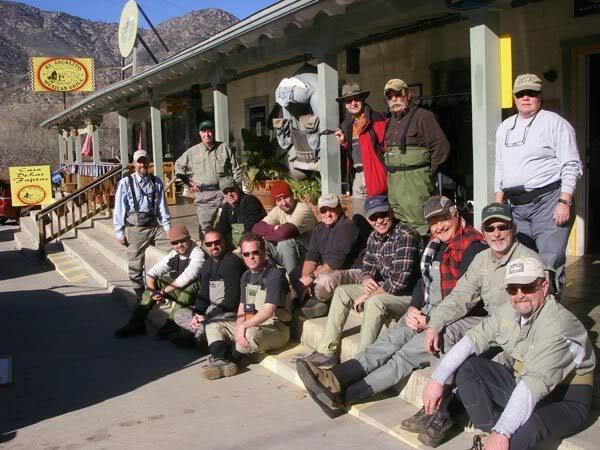 THE COUNCIL, ALL OF ITS MEMBERS, AND JOINED BY MANY FLY FISHING CLUBS THREW OUT SOUTHERN CALIFORNIA WORK DAY AND NIGHT TO PUT TOGETHER THE VERY BEST SHOW POSSIBLE. 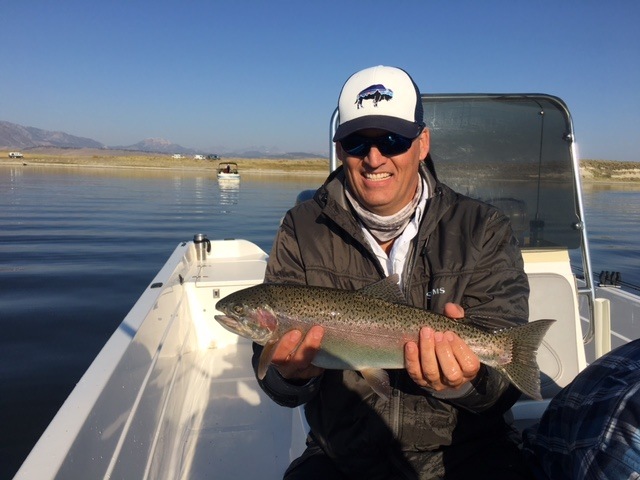 THIS IS A MUST TO BE PART OF WITH PROFESSIONAL GUIDES AND TEACHERS TO SHOW YOU EVERYTHING YOU WOULD EVERY NEED TO KNOW ABOUT FLY FISHING. I HIGHLY RECOMMEND YOU ATTEND ALL THREE DAYS OF THE SHOW! 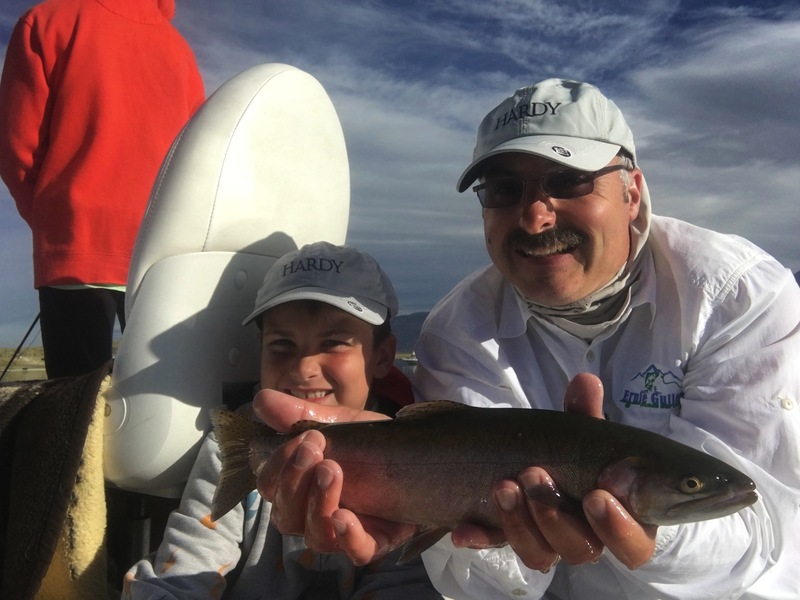 LAST WEEKEND I WAS ABLE TO SPEND SOME TIME WITH MY FAMILY UP AT CROWLEY AND TEACH MY CHILDREN HOW TO FISH WITH FLY RODS AT CROWLEY. MY SONS, AIDAN (8) AND LOGAN (12) HAVE BECOME VERY SOLID AT ROLL CASTING, MENDING AND CATCHING FISH WITH CHIRONOMIDS UNDER AN INDICATOR. THEY HAVE PUT ON A FEW SHOWS OUT ON THE LAKE AND I AM SO PROUD OF THEM AND HOW FAR THEY HAVE ADVANCED TO BECOMING VERY CONSISTENT ANGLERS AND BEING ABLE TO FISH ALL BY THEMSELVES. HERE ARE A FEW PHOTOS OF SOME VERY NICE FISH THEY LANDED AND RELEASED OVER THE HOLIDAY WEEKEND. 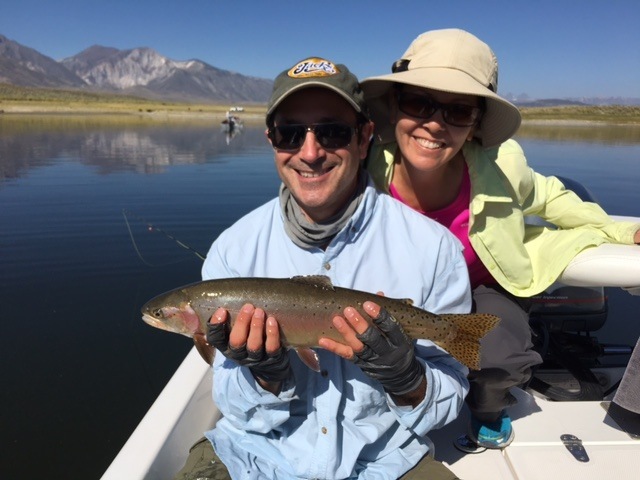 I ALSO HAD THE PRIVILEGE AND OPPORTUNITY TO GUIDE TWO EXCELLENT FLY FISHING GUIDES, COURTNEY DESPOS AND WHITNEY INMON. THEY LANDED SOME REALLY NICE FISH OVER THE TWO 6 HOUR SESSIONS WE PUT IN ON THE WATER. THE FIRST AFTERNOON WE BATTLED 20+ MPH WINDS BUT STILL MANAGED TO LAND SOME NICE FISH. 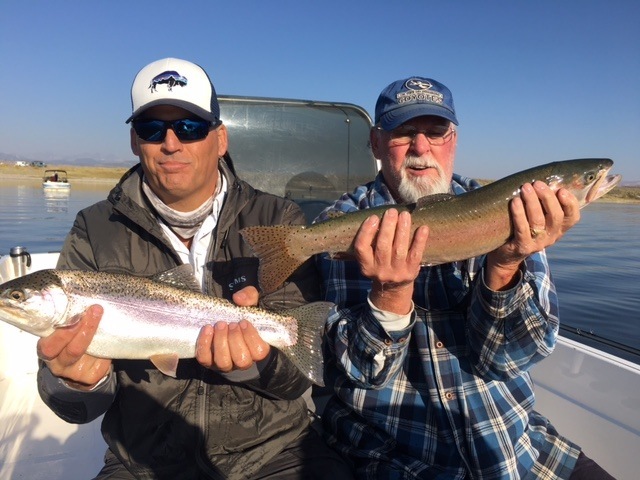 THE NEXT MORNING, MUCH BETTER WEATHER, WE WERE ABLE TO LAND MANY FISH TO THE NET BUT NOTHING OVER THE 17" MARK SO WE WERE VERY UNLUCKY TO NOT GET INTO SOME OF THE 20" TO 24" TANKERS THAT CROWLEY IS KNOW FOR! BETTER LUCK NEXT TIME, CROWLEY WILL ALWAYS BE HERE WAITING FOR A REMATCH! IN A NUT SHELL, CROWLEY LOOKS TO ME TO BE PRIMED TO HAVE AN EXCELLENT FALL FISHING ENDING SEASON AND I FOR ONE AM LOOKING FORWARD TO SEEING THE LARGE NUMBER OF BROWNS IN WOLF PACKS, PATROLLING THE DEEPER DROP OFFS OF THE LAKE AND LOOKING FOR A NICE TASTY RAINBOW IN THEIR DIET. HOPEFULLY WE WILL ALL HAVE THE OPPORTUNITY TO LAND ONE OF THESE BEASTS, PHOTOGRAPH AND PROPERLY RELEASE THIS BEAUTIFUL ANIMAL AND SEND IT BACK DOWN TO THE DEPTHS TO LIVE AND GROW FOR MANY YEARS TO FOLLOW. JUST WANTED TO GIVE ANOTHER SHOUT OUT TO MY SPONSOR "HARDY" I HAVE BEEN VERY LUCKY TO BE PART OF SUCH A FANTASTIC COMPANY AND HAVE USED THEIR RODS AND REELS THE WHOLE SEASON. THESE HARDY ZEPHRUS RODS AND ULTRALITE CADD 5000 REELS AND BEEN THE BEST RODS AND REELS I HAVE FISHED. MY CLIENTS HAVE ENJOYED FISHING THIS ROD AND REEL SETUPS DURING THIS SEASON AND I HAVE HAD MANY COMPLIMENTS ON HOW SMOOTH AND POWERFUL THIS COMBO PERFORMS. I WANT AGAIN TO TAKE THE TIME TO THANK "HARDY" FOR THE OPPORTUNITY TO BE PART OF THIS FANTASTIC COMPANY AND LOOK FORWARD TO HAVING A LONG, LASTING RELATIONSHIP WITH THEM FOR YEARS TO COME. HERE IS ONE OF THE NEWEST REELS OUT OF HARDY LINE AND I LOOK FORWARD TO TAKING THESE BEAUTIES FOR A SPIN OUT ON THE WATER SOON! IF YOU WOULD LIKE TO SEE MORE OF HARDY PRODUCTS, PLEASE GO TO THE HOME PAGE OF MY WEBSITE AND AT THE BOTTOM OF MY PAGE JUST CLICK ON THE HARDY LOGO AND YOU WILL BE TRANSPORTED TO THE HARDY WEBSITE. GOOD LUCK OUT ON THE WATER, PLEASE BE SAFE! 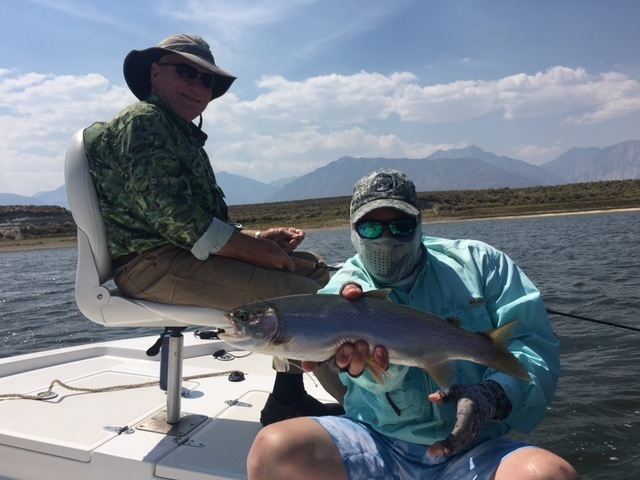 HOW ABOUT THIS CHROMER FROM "THE PATRICIA"
GUY OF THE CALIFORNIA FLY FISHERS UNLIMITED FLY FISHING CLUB ALONG WITH GOOD FRIEND GARY HAD OVER 40 FISH TO THE NET FOR THEIR TRIP!